After a good night rest at the Empire Travel Lodge in Lochgilphead I felt much better. My stomach had calmed down and I had a full breakfast (well, almost. Couldn't finish it all) before leaving for the ferry terminal at Kennacraig. 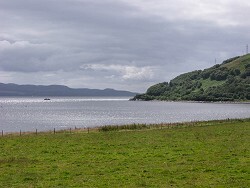 Occasionally the sun came out, giving me a few beautiful views of the coastline between Lochgilphead and Tarbert. As I had enough time left I also stopped at West Loch Pier. In the past this used to be the ferry terminal until the ferry being used for the Islay service became too big to reach it. 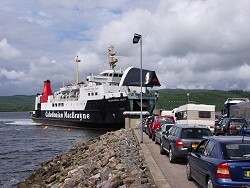 A new terminal was then built at Kennacraig, a few miles down the coast. Kennacraig is actually not a village of any sort, just the ferry terminal on a small island linked to the mainland via an artificial causeway. Soon the ferry arrived and boarding was completed, ensuring that we left exactly on schedule. Unfortunately the weather deteriorated during the journey with the clouds getting thicker and thicker. 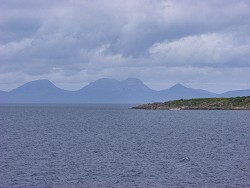 It was still possible to see the Paps of Jura on starboard though, soon followed by the distilleries of Ardbeg, Lagavulin and Laphroaig. 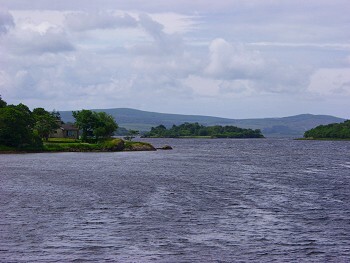 On the right a view of Laphroaig, the last of the three distillieries coming into view on the outward journey as it is closest to Port Ellen. 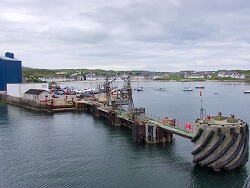 After two hours we arrived in Port Ellen on Islay. 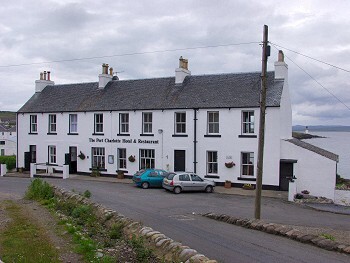 With a stop in Bowmore I continued my journey to Port Charlotte, where I had booked a room in the Port Charlotte Hotel. Room 7 was ready for me, a very nice room with a view over Loch Indaal towards Bowmore. I finished the day with an excellent dinner of Islay beef at the hotel restaurant. A good start for my stay on Islay, let's see how the weather will develop over the next few days.